RSteven, clhboa and Shawn like this. I get the point your making but I'd take listening to Harum Scarum or Paradise Hawaiian Style on constant repeat for however long you want over anything that causes me physical pain. Yup, I'm allergic to anything that may hurt. I'm a certified baby when it comes to pain! As Skatterbrane noted, I wasn't trying to say that listening to Harum Scarum is as painful as getting a root canal. I just was making the point Harum Scarum, Frankie and Johnny, and Paradise Hawaiian Style are all bad albums, and as such there's not much point to me in making a distinction about which is the least bad (just as there's little point in discussing whether a root canal is "better" than an ingrown toenail). The degree of quality difference between them is small. RSteven and mark winstanley like this. What, did you just watch it for the first time? 48 mins in ... b grade would be a compliment. Keep watching, and it will put you to sleep. ...This track is piano led and has Elvis singing in that gentle high voice that has all the longing and heart break required to sell this song. This song really is quite beautiful and touching. Amen! I rank "I Met Her Today" as one of Elvis's most exquisite ballads. His singing was rarely more sensitive and graceful than it is here. The way he caresses the line "all at once now I don't caaaaare as much for you" is only surpassed by the way he swoops down on "just when the last bit of priiiide in me was gone..."
"I usually made my demos in Hollywood at the famous Gold Star Studios with the legendary Stan Ross manning the board. 'I Met Her Today' was an exception. I played and sang it live for the Aberbachs (Hill & Range Songs) in their offices in the Brill Building at 1650 Broadway in New York City (where many music publishers were located) and they wanted me to make a demo right away, so I went to a little studio nearby (just voice and piano as I recall)." You can see how Robertson influenced Presley's phrasing, though Elvis sings with more delicacy. The demo is faster-paced and swings more, but Elvis rightly decided to slow the pace and go for a starker arrangement. The result has a wonderful intimacy to it. mark winstanley and RSteven like this. "The DEGREE (emphasis mine) of difference" does not mean Harum Scarum is equal to root canal when it comes to pain. It is a ratio between Harum Scarum, and Paradise Hawiian Style vs. root canal and a severely ingrown toenail (of which I have had two). So let's say root canal and ingrown toenail is 7.5 on the pain scale (if being burned alive would be 10) and Harum Scarum, Frankie And Johnny and Paradise Hawaiian Style would be a 2 (slightly annoying). So comparing the choices in EACH set, all choice are the same, but the sets are different. 2 is to 2 is to 2 are all the same scale. 7.5 to 7.5 are the same scale. Neither set has a degree of difference worth arguing about. I think that is the point. I have never had a root canal however. And I hope you never do! I got the 'Collectors Gold' box set on CD before the 'Harum Holiday' (UK title?!) album and liked the sound and feel, enhanced for me with the added reverb (sorry @SKATTERBRANE!) on the outtake of 'So Close...' and decided to seek out said album. It sounded like a rough mix in comparison! Together with a bunch of lousy songs and low grade recordings it was something of a disappointment to say the least. Together with 'Frankie and Johnny' I think these two are the few soundtracks the Double Features CD series made a major improvement to. Harum Scarum is the eleventh soundtrack album by American singer and musician Elvis Presley, released by RCA Victor in mono and stereo, LPM/LSP 3468, in November 1965. It is the soundtrack to the 1965 film of the same namestarring Presley. Recording sessions took place at RCA Studio B in Nashville, Tennessee, on February 24, 25, and 26, 1965. It peaked at number eight on the Top LP's chart. Eleven songs were recorded for Harum Scarum, and all were used and issued on the soundtrack with two of the tracks omitted in the film. As with Roustabout, no singles were issued in conjunction with the album. A single was issued a month later, using the leftover 1957 track "Tell Me Why" backed with "Blue River" from the aborted May 1963 "album" sessions. In an ominous sign of things to come, it only made it to number 33 on the Billboard Hot 100, the lowest charting single of Presley's career to date. So I watched the movie for the first time last night, and it is truly quite dreadful. The movie is cheap and nasty, poorly scripted, poorly acted and really has not much in the way of redeeming features. The album isn't much better and although there are some half decent performances, are there any songs worth hearing, well we'll see, but I'm not going to get too confident that there is to be honest. This album and movie show directly what was wrong with the whole Hollywood idea for Elvis. This stuff is cheap, trite, rushed and unloved, and listening to it, or worse still watching the movie, shows it out for exactly that. Dave112, RSteven and When In Rome like this. I agree that the movie is a disaster on pretty much every level. However, as I posted yesterday, Go East Young Man is somehow a pretty good song, and I don’t hate Golden Coins and My Desert Serenade. Despite the work rate required of them, the Baum/Giant/Kaye team managed to produce some OK ballads for this awful film. Shawn, RSteven, DirkM and 1 other person like this. I certainly don't hate it. It just seems so unfortunately average for a singer and performer of Elvis' caliber. Crappy movie, crappy soundtrack and crappy sound. I think So Close, Yet So Far (From Paradise) is the only ok song. But it's not his worst album. There are two albums worse than this one in his discography, imo. **** material aside, you would think these sessions were recorded on a soundstage, and not at Studio B. The sound quality is horrendous. Ok, I have to stick up for this poor* album. Yes, the sound on the original album is abysmal (muffled vocal sound, insanely awful mix, etc.). Yes, the lyrics are uniformly silly (So Close, Yet So Far being the sole exception). But they're so silly that they have a charming campiness about them. On a musical level, I quite like the way the arrangements sound like no other album (Elvis or otherwise) that I own. I'm not saying that I would necessarily want to own a dozen albums just like this, but it's nice to have this one to add some variety to my listening experience. And I do enjoy it; there are some very attractive melodies here, and Elvis sings a lot better than the album's reputation suggests. No, it's not even close to the purity or effortless beauty of his early 60s voice, but there are some great moments here regardless. *I just realized that this may be an unfortunate choice of words, but I'll let it stand. Tord, RSteven and mark winstanley like this. 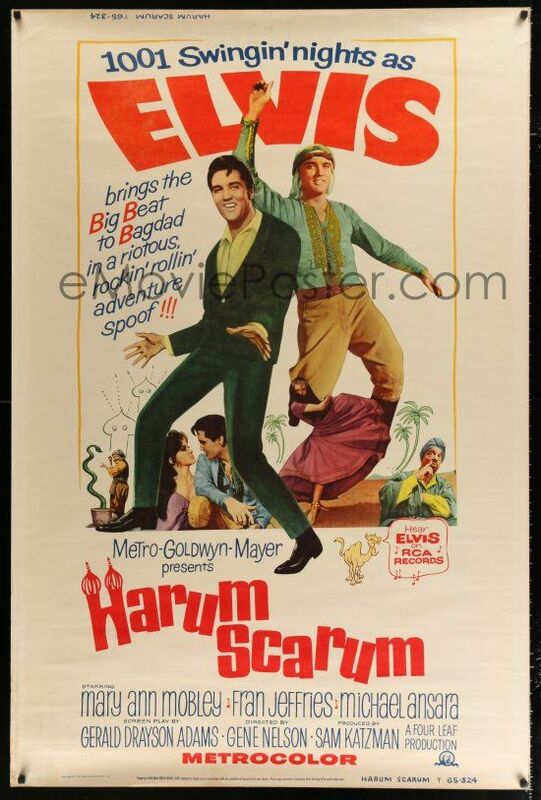 Harum Scarum is the *only* Presley movie I never made through from start to finish. And that's saying a lot, because some of the others are poor but I've made it, more than once. Terrible soundtrack. While some will disagree, "Shake That Tambourine" is perhaps the only listenable track. My pick of "not quite as bad as the others" would be So Close Yet So Far, Animal Instinct and Wisdom Of The Ages. Yeah, it's mystifying. This album features Elvis' only Nashville (RCA studio B) recordings between the January 1964 "It Hurts Me" session and the May 1966 How Great Thou Art sessions, yet the result is the worst-sounding Elvis record yet. In her book, Priscilla tells an anecdote about an incident in which Elvis discovers the Colonel has ordered the RCA engineers to put his voice higher in the mix without his knowledge, because "people buy Elvis records for Elvis." Elvis is infuriated and demands this be stopped. She doesn't specify when this happened, but the 1965 (and to a lesser extent 1966) recordings are the likely suspects. To me this album is rock bottom. The next two may be as bad or slightly worse depending on individual opinion, but the degree of difference is slight. I agree that 1965 was rock bottom for Elvis. And yet, in 1966, we see the first tentative steps towards climbing out of the rut that he was in, as exemplified by the minor miracle of Tomorrow Is A Long Time and the 1966 home recording of Blowing In The Wind. Then comes the return to gospel with How Great Thou Art, and the return to credible rock with the Guitar Man session in 1967? The last movies before the ‘68 Comeback and the ‘69 Memphis sessions may not be great cinema, but at least they’re interesting failures: Live A Little Love A Little and Change of Habit gently push the boundaries of what an Elvis Presley movie could be. Later soundtrack songs such as Edge of Reality and Clean Up Your Own Backyard are more timely, more topical, and just plain better than formula fluff of the Harum Scarum soundtrack. The ‘68 Comeback didn’t just happen because Elvis and Steve Binder snapped their fingers one day in 1968. It took two or three years to climb out of the hole of 1965. I don’t think it’s a coincidence that Elvis’s return to form coincided with his marrying Priscilla and making, for a time at least, an effort to grow up and settle down in his personal life. Tord, MaestroDavros, RSteven and 4 others like this. Listening to the boot I mentioned earlier, the remixed version on the Double Features CD as well as the outtakes, the actual recording is on par with most everything else up to this point post-Bill Porter. I'm not sure where the loss of fidelity on the stereo LP masters occurred, but certainly thes tereo LP mix is the worst yet (up to 1965). I've got to pull out my mono LP to see if it's just as bad. And the session musicians (as well as Scotty and DJ) are top-notch, so it's not like they played badly. Speaking of the outtakes, Elvis sounds to be at least enjoying himself / being in a pleasant mood. The material is sub-par, but it seems he's at least trying. I do like the cover artwork illustration quite a bit. It's too bad it - or something else by the same illustrator - couldn't have been incorporated in to the film's US movie poster. Is the bootleg mix the same as the Double Features mix? Elvis was showing signs of life behind the scenes in 1967 and 1968 (pre-Burbank), but none of the secular recordings issued made any impact in the conscience of the public. As great as things like "Tomorrow Is A Long Time," "Too Much Monkey Business," "Guitar Man,"and "U.S. Male" are, they pretty much went unnoticed. Out of all of the secular, non-soundtrack recordings from that period, Elvis did not deliver one mainstream, commercial album. Even the improvement in quality with soundtracks such as "Live A Little, Love A Little" was too little, too late. The reality is that the resulting reemergence due to the '68 Comeback was essentially a snap of the fingers, because there was not a noticeable uphill climb back to the top -- for many observers, it came out of nowhere on December 3, 1968 after several years of terrible films and forgettable soundtrack recordings. Without Binder and the Singer Presents Elvis television special, a few isolated and buried secular recordings, some soundtrack quality improvement, and a gospel album were not likely going to propel Elvis back into relevancy. It took something major, and I do not think Binder's success with Elvis was associated in any way due to any tentative steps Elvis had taken during the preceding 18 months. That said, your point is well taken, behind the scenes Elvis was working his way through a difficult period, and his "How Great Thou Art" LP was the first project he had invested himself in after quite a number of years of turning his back on his craft. Revelator and mark winstanley like this. Cursory comparison and I'd say they're different. The boot seems to be closer to the LP mix, but without Elvis' so up-front. SKATTERBRANE and mark winstanley like this.